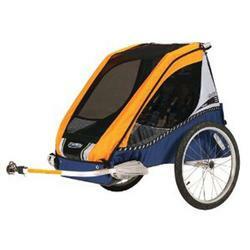 The Cabriolet is the Original Chariot bike trailer . Designed for outdoor enthusiasts who place an emphasis on cycling, the Chariot Cabriolet is a fantastic two-passenger bicycle trailer that converts easily to a jogging stroller, walking stroller, or hiking carrier. . . all by utilizing the same patented VersaWing 2.0 technology as other Chariot carriers like the Cougar 2 , Corsaire XL , and CX 2 . Built on an anodized aluminum frame, the Cabriolet is the lightest two-passenger Chariot carrier, and has the smallest folded dimensions of the bunch. Standout Features: Comes complete with the Chariot CTS Bicycle Trailer Kit Compact fold Uses VersaWing 2.0 technology for quick and easy changes between CTS Kits Benefits for You: The lightweight aluminum frame makes hauling 100 lbs of kid and groceries easy and breezy while the alloy wheels trim down the poundage. And with a roomy rear storage compartment, picking up dinner on the way home has never been easier. Installation: The Chariot Cabriolet comes ready to stroll. Simply attach the hitch and pedal away! The VersaWing 2.0 technology makes attaching any other CTS Kit just a matter of pulling a pin. Compatibility: The Chariot Cabriolet comes ready to roll. Transform your Cabriolet into a stroller, jogger, or hiking trailer with any of these CTS conversion kits: CTS Strolling Kit CTS Jogging Kit CTS Hiking Kit Benefits for Baby: The Cabriolet makes passengers comfortable with plenty of padding in the seats, an integrated helmet space for slouch-free sitting, and oodles of vents for breezy riding. When weather strikes, pop on the weather cover for protection against wind and rain. The front sun shade keeps their little eyes from squinting.